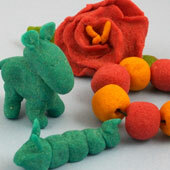 This recipe makes a durable and very pliable clay that can be colored vibrantly. This clay is particularly good for making items that will see heavy use, like beads and playing pieces for games. All you do is mix white glue into shredded white bread and add color with a bit of paint. This recipe makes enough dough to make beads for a necklace and a bracelet, or a set of game pieces for a board game. It's easy to make more clay by just doubling or tripling the recipe. Related crafts: For a clay made with salt and flour that is colored with food coloring, see the Homemade Modeling Dough Recipe. For a lightweight molding material, see Quick Papier-mâché Pulp. For a scented clay, see the Cinnamon Clay Recipe. Remove the crusts from the slices of white bread. Tear the bread into very small pieces and place into a bowl. It's important to use white bread to make a white base for other colors. Add the glue to the bread a little at a time while mixing with a spoon and then mix with your hands. This is a bit messy, and you may prefer to wear gloves, but the final clay is well worth the effort and the mess. The bread and glue mixture will come together into a ball as you mix. Continue to knead until the clay becomes smooth and pliable. Add more glue if the clay is crumbly, and add more bread if the clay is tacky. (optional) To add a nice smell and prevent the clay from going sour, add a few drops of lemon juice. If you use the clay immediately, you don't need to add lemon. For colored clay, knead a few drops of paint into the clay. Knead thoroughly to get an evenly colored clay. 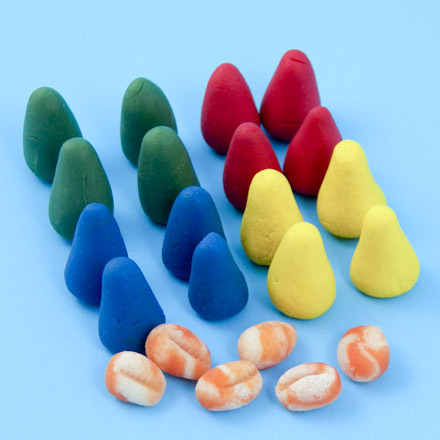 If you are making beads or game pieces for a game like Pachisi, divide the white clay into four balls and color each ball a different color. Store clay in a zipper sandwich bag until you're ready to use it. If the clay feels a bit crumbly after storage, knead in a few drops of water to make it smooth and pliable again. To make beads: Pat or roll out the dough to a thickness of about ¼". 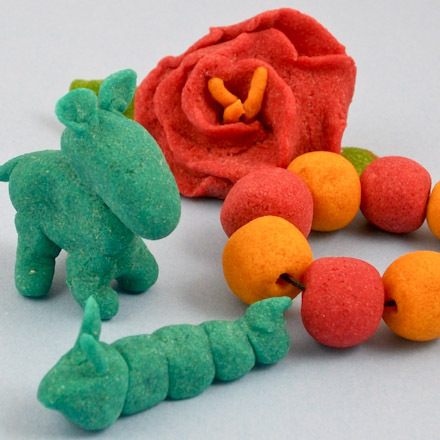 Use a drinking straw, plastic caps, or polymer clay cutters to cut beads like those pictured. 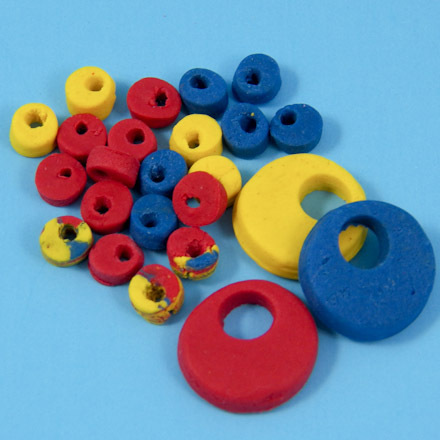 To make round beads, first roll the clay into a snake and cut off even segments. Roll the clay into balls between the palms of your hands. Use a toothpick or a needle to make holes in the beads for stringing. Let the beads air-dry in a warm place for a few hours or overnight. 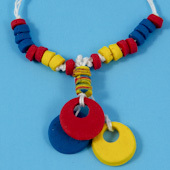 Tip: The small pendants are cut from rolled dough using a plastic cap; the string hole is cut using a drinking straw. To make game pieces: Bread clay is ideal for making playing pieces for board games like Pachisi. The clay is easily tinted in vibrant colors; items made with bread clay are durable and won't shatter when dropped. Use your hands to shape game pieces in the desired shapes and sizes. To ensure that all of the pieces are the same size, roll the clay into a snake and cut off even segments. Let the game pieces dry for one or two days before using them. That's it! Your clay is ready to use! Related craft: You can use bread clay to make charms and pendants for necklaces and bracelets. 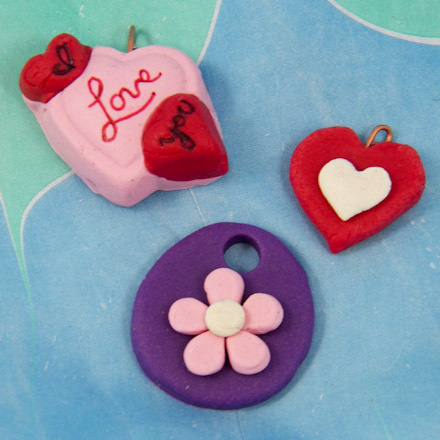 See the Homemade Clay Charms and Pendants craft project, which contains three techniques for making heart and flower pendants and heart charms from bread clay. Related craft: Use Homemade Modeling Dough Recipe to create items with finer details; however, items made with this clay are more fragile than those made with bread clay.